Fri., April 20, 2012, 6:14 a.m.
COLFAX — Halfway through Monday’s Boston Marathon, everything was going according to plan for Colfax Mayor Todd Vanek. He felt fine and was running smooth, reeling off the first 13.1 miles in 1 hour, 33 minutes. The time put him in the Top 200 in his division, men ages 45 to 49. It was exactly the same pace he set last year when he completed the Missoula Marathon in 3 hours, 7 minutes and qualified for Boston. Then the heat and possibly a problem with a different sports drink caught up with him. Vanek was elected mayor of Colfax in November. He trained for Boston in the early mornings and evenings, doing speed work, hill climbs and long-distance runs across the Palouse. Every other week he’d run from work in Pullman back home to Colfax — a distance of about 17 miles, depending on which route he took. But 17-mile runs on the Palouse in March can’t prepare you for 89-degree temperatures in Boston in April. “I don’t think I’ve run in 89 degrees since I left Virginia,” Vanek said. More than 22,000 runners started the 116th edition of the marathon — about eight times the population of Colfax. They left in waves, women and wheelchair racers first, then the elite men at 10 a.m., followed by “pods” of slower runners. The race itself was like a 26-mile long rock concert, he said. 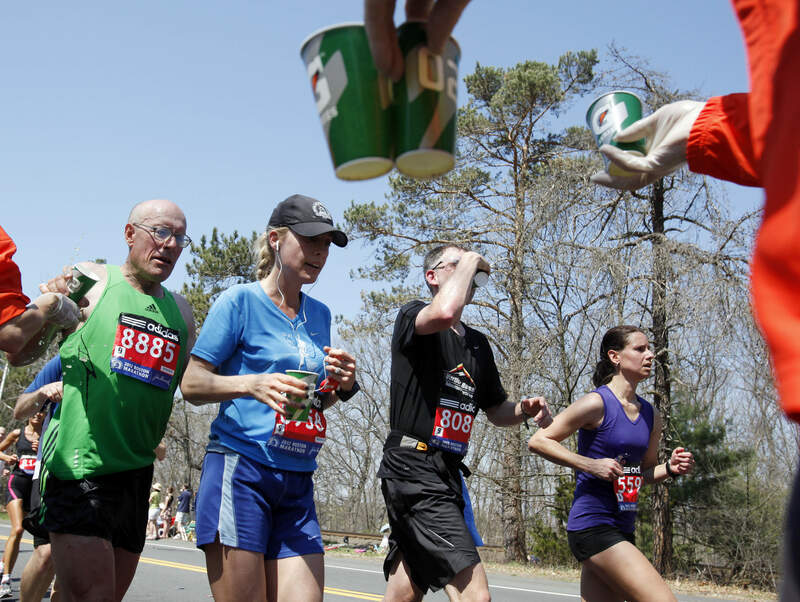 Gatorade may have been part of the reason why he didn’t enjoy the second half of the race quite as much as the first. He started drinking more water, trying to flush the Gatorade out of his system. That helped him feel better, but it didn’t replace the sugars and minerals he was using, so his energy level dropped. He continued to walk the course, crossing the finish line in 4:07. “For me, every race comes with reflection,” Vanek said. “What did I do right? What did I do wrong? It will take me a couple of long runs to figure that out. The Gatorade was a problem and the heat was clearly a problem. That mental discipline is ultimately what appeals to him most about running, rather than any physical ability. “It’s not about running a marathon,” he said. “It’s about (not) saying ’I can’t’ and limiting myself. It’s about determination. … I think people confuse long-distance running with a desire to be strong. But to me, the ability to control your mind is the greatest challenge. There’s a little pain, but suppressing it so you can think clearly — it’s awesome. Despite his struggles, Vanek has already recovered physically from Monday’s race. He and a group of friends are planning to take part in Washington State University’s 100K (60 mile) team relay race this weekend. Story from the Lewiston Tribune, www.lmtribune.com. Published: April 20, 2012, 6:14 a.m.